DVC92 is part of the 2017 Super Treasure Hunt set and is 2/10 in the HW Daredevils series. It is Spectraflame green with olive graphics, black stripes, and “92” on the roof and sides. The sides also have the Hot Wheels logo, “HW Daredevils”, “TH”, and a Rat Fink styled image. The car has a black interior with roll bars, Real Rider wheels with green spokes and blue rims, and a black plastic Malaysia base. 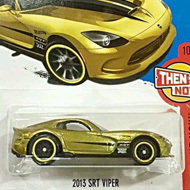 This vehicle can be found in mix “K” of 2017 Hot Wheels mainline cases. The Cruise Bruiser made its debut in the 2016 HW Daredevils series. It is an original design of a family station wagon modified for a demolition derby.